My apologies for the irregular cadence of this column this offseason. I have focused on work for the RotoWire draft kit and magazine publications, not to mention the day job requiring some weekend time to sufficiently close the book on the 2018 season. I type this piece on my first day of vacation, one in which I plan to pump out a few pieces to get the content back on a regular cadence because articles written now can still run brand new a few weeks from now. "[Lance Lynn] is someone I definitely will avoid on draft day. I would much rather have Matt Harvey." My gut reaction was one of surprise because I told my car radio I wanted the exact opposite outcome on draft day. This opinion was purely based on observation rather than any dive into the numbers or video to see if anything has changed. Thus, the hypothesis of this column is Zimmerman is off his rocker, but since I find myself in agreement with his advice more often than not, I wanted to take a deep dive into what he may be seeing in Harvey to want him that much more than Lynn. 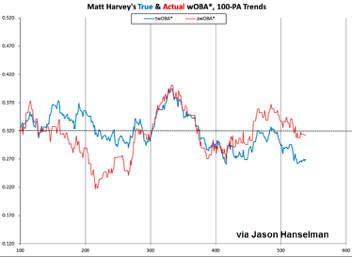 Harvey was last fun to own back in 2015 when he was pushing 100 on the guns, filling the strike zone up, and shoving the baseball every five days. If you had Harvey at a cheap price in a keeper league, you had feel very good about your fantasy fortunes heading into the 2016 season. Injuries decimated Harvey in 2016 and 2017, and it was only last year he began to show some signs of the guy he once was. On the whole, Harvey went 16-26 with a 5.39 ERA and a 1.45 WHIP the last three seasons with an 18 percent strikeout rate and an 11 percent K-BB%. TOS surgery is still a relatively new and unknown thing. BeyondTheBoxscore wrote a review in 2015 of pitchers that had the surgery and how they rebounded from it. 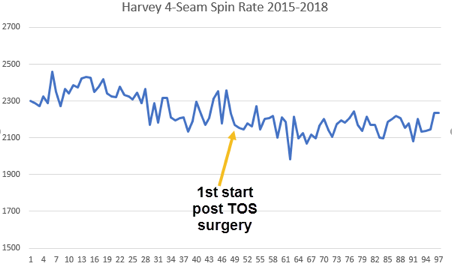 Lindsey Berra wrote about it for MLB.com in 2017 noting that roughly 20 pitchers had undergone the surgery so recovery from it is still in an amorphous state. Jason Woodell of ProspectStorm wrote a piece in April 2018 with more of a sports medicine angle to it. He noted the average rehabilitation time for the surgery was 11 months. Harvey was back on the mound in a regular season game just over eight months after surgery and won his first start against the Braves on 4/6/17. He continued pitching until mid-June when he had a stress injury to the scapula bone in his shoulder which led to 10 weeks on the shelf before coming back to the mound to pitch throughout September. Harvey's slider remains his best pitch, followed by the curveball. 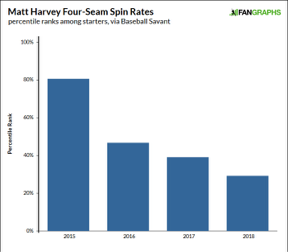 It would seem that a successful path forward would be for Harvey to use more of his breaking balls and continue a reduction of his fastball usage. Enter Doug White. White is the new pitching coach for Harvey's new employer - the Los Angeles Angels of Anaheim. White takes over for Charles Nagy after spending the 2018 season as the bullpen coach for the Houston Astros. White had previously worked as a pitching coordinator in the minor leagues and as a roving pitching instructor for Houston after coming over from the Cardinals organization where he worked as a minor league coach for five seasons. It should not be lost on us that Houston led all major league clubs in breaking ball usage the past two seasons, throwing 34 percent sliders and curveballs. How much of that is White's influence, but his bullpen last year threw 36 percent breaking balls, which led all bullpens in baseball. He is taking his fastball and mostly working away from righties and lefties, which goes against what Effective Velocity teaches us. He is taking his low-spin and lower velocity fastball and giving hitters extra time to do something with the pitch by mostly working away from batters with the pitch. It was particularly problematic against lefties, who had a .471 wOBA off his fastball last season, and a .424 xwOBA was not much better. In short for Harvey, there is a path forward for success as he is in Anaheim for a single season to be rebuilt for another shot at the open market in 2019. We don't know what his fingertips feel like, but we do know his breaking balls are still effective pitches for him. We do know that he has worked against himself but using his fastball primarily away from hitters rather than inside to them thus giving hitters more time to decide what to do with the pitch. 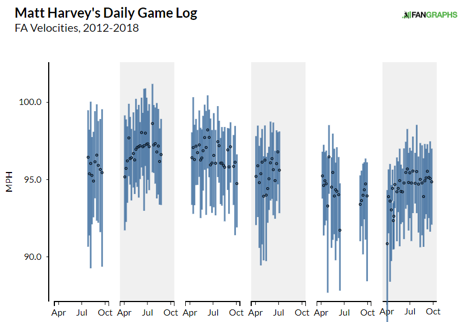 Harvey may never get his velocity or spin rate back on his pitches, but increased utilization of his breaking pitches and a relocation of his fastball's primary residence appear to be the best path forward for Harvey to rebuild both his market value as well as his fantasy value in 2019.